On this day, I am blessed to celebrate the miracle of my own life. As I celebrate another year of life, I am in a place of deep gratitude and reflection. I spent some good time with God on the eve my birthday and again this morning. I continue to be in complete awe of how He has completely transformed and transfigured my life. I literally feel like a new being. As I spent time listening to songs that have spoken to my spirit for years, I shed tears in reflection of the awesome experience of God stepping into my life and extracting out EVERYTHING that is not like Him. While the journey has often been difficult and tumultuous, I would not trade it for the world. I would not take ANYTHING for my journey now! Thankfully, my “Job Journey” has come to an end. God stepped in and fully restored my health, transformed by body, renewed my mind, healed my heart, restored my soul and is blessing me with great abundance. My life has been transformed in ways I could have only imagined. So much so that I sometimes look in the mirror and don’t recognize myself. And while the physical transformation has been an extraordinary blessing, it is merely a manifestation of the healing and transformation that has occurred within. God healed me from the inside out and re-created me into His original creation. The Divinely blessed, healed and whole person I was always meant to be. I received beautiful confirmation of my transformation from God in a dream a few nights ago. I was traveling down the basement stairs of my childhood home. At the end of the stairs was a spider web with a caterpillar in it. A few moments later the most beautiful butterfly appeared and flew off. 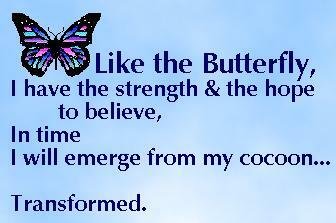 An awesome depiction of my own metamorphosis.God speaks in so many different ways, even through our dreams! I know in the depths of my soul that God stepped into my life and removed all of the darkness that resided within so that I could come forth and be Divine light. I am now blessed to awaken each day with extraordinary joy in my spirit. I am blessed to be so filled with love that I openly share it with those in my life and oftentimes perfect strangers. I am often happy for no reason at all. I am blessed to know my purpose and serve that purpose each and every day. I am blessed to know the true meaning of the peace that surpasses all understanding. I am blessed to be in an extraordinary place of spiritual flow with God and the Universe where all just seamlessly occurs in my life. It is an absolutely beautiful experience! And, God reminded me that it was my willingness to surrender to His will that opened the door to these wonderful blessings. As I begin the first day of my 44th year (an angelic number), I have a great deal of excitement and anticipation in my spirit. I know that God is just getting started and the best is yet to come! I know in my heart this is going to be the most extraordinary year of my life yet! This is the year that God keeps His promises and answers my prayers in the most extraordinary way. And while immensely grateful for my new life, I also know that my healing, blessings and transformation are not just for me. I have been blessed to be blessing. It is my responsibility to share with others all God has done in my life and help many along their journey of healing and transformation. Thank you Father God for another blessed year of life. I am eternally grateful for my extraordinary new life. Thank you for making me new and using me as a vessel of your Divine gifts and blessings. Thank you for allowing me to be a blessing in the lives of others. I pray that I make you proud!